Choosing unique wedding invitations can be a daunting task when it comes to planning your big day. For many couples, wedding invitations are selected before the details of the event itself are finalized. Picking wedding invitations that you love is a great way to start the process of planning a wedding. Beautiful and unique invitations can be the icing on the cake to an already perfect day. The wedding invitation also sets the tone for your day, by offering clues to the kind of wedding your guests will attend; so it is important that you choose a wedding invitation that speaks to your unique style and complements the style of your wedding. There are thousands of different types of wedding invitations available, from classic and traditional to modern and funky. The choices are wide and far reaching. Choosing that one invitation style that is perfect for the two of you can be a long and intimidating task. You know that you want a unique invitation that begins to tell the tale of the life you are creating as a couple, not an easy task, but it can be done! Finding a unique wedding invitation starts with a conversation. Perhaps there is a hobby that both of you love to do. You can use this ‘theme’ in your wedding invitations as well. If you both love to fish, you could use fishing line and lures for your invitations, or a hobby of wood-working could provide you with a way to expand your hobby into creating some special invitations. Regardless, if there is a hobby that the two of you share that helps to define you as a couple, don’t be afraid to use it to your advantage and choose the best part of your hobby to direct your unique wedding invitation choices. There are many choices when it comes to wedding invitations that are pre-made. 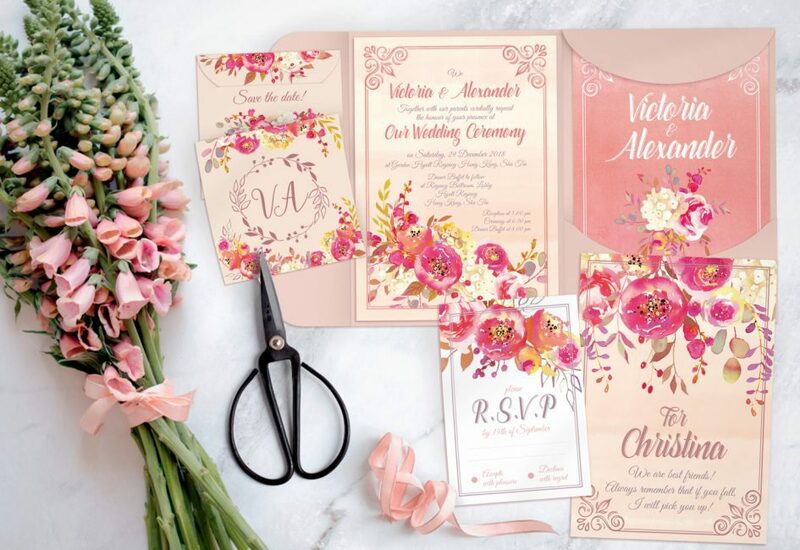 While you may not want to choose a pre-made pack of wedding invitations, you can mix and match from a variety of sets to create a wedding invitation set that is totally unique to you and your spouse to be. Really love that Vera Wang paper but dig the Anna Griffin envelopes? Well, order them both and put them together. As long as you both like it – there’s nothing wrong with mixing up a few different sets to create your own unique wedding invitations. Remember, this day is all about the two of you and your choices and individuality should ring through the entire event, starting with the invitations. There are also many options for mix and match wedding invitations. These are often sets of invitations that have many different options available for each of the pieces of your invitation set, from invitation paper to envelopes, fonts and scripts and more. By hand selecting these choices, you can create an individualized look to your invitations that speaks of the two of you as a couple without having identical invites that someone else has. Being unique in all your wedding choices is what many couples are looking for. Most do not want to have a wedding that is almost the same as the wedding you and your friends attended last summer. Select want a fresh, new look that will be unique to you and be different from everyone else. This is your special day and it should be all about you two as a couple, and you can begin this tradition with unique and individualized wedding invitations. Check out the variety of invitations that are available and start choosing your own personal style.